Add some greenery. Place a pot of minty eucalyptus on the counter, or any bright greenery that loves moisture, to add a fresh look and feel to your bath. They look pretty and smell relaxing, too! Add a basket or two. A trick from resort hotels, pile a stack of soft towels on a small stool and put a basket of lovingly chosen lotions and soaps on the counter. 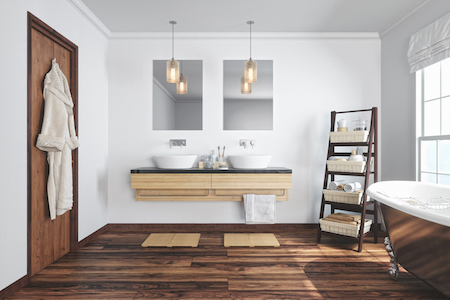 It’s a quick and easy way to make a bathroom feel luxurious. Choose bath mats carefully. Fabric mats can collect moisture and get moldy, while a slatted wooden bamboo stays clean longer and adds a little Zen to your retreat. Introduce aromas. A spa appeals to all your senses, including scent. To aid in relaxation in your home’s bathroom, light a candle with a soothing aroma, like lavender or eucalyptus, or put out some essential oils. Hang some artwork. Give yourself something visual to focus on as you lounge in the tub. Hang a print with a relaxing theme, such as ocean waves or a tropical beach scene. Add a bath caddy. The shower caddy is too high if you’re in the tub. Corral all your bath supplies, from soaps and shampoos to loofah sponges, in an easy-to-reach caddy hung at tub level so they are at your fingertips when you need them. Tie everything in with a shower curtain. The shower curtain takes up a lot of space in a small room, so hanging a new one with a chic and minimal design can dramatically change the room’s atmosphere. Make some updates. And if you really want an impressive spa-like bath, make some upgrades like adding heated floors and a rainfall shower head.